The thing that makes me happiest in the world is seeing audiences respond to classic films with joy and wonder, and that’s exactly what I saw Wednesday night when Cinefamily screened Modern Times to a nearly full audience. First off, it’s awesome that 150 people will choose a Chaplin silent film over the hoards of other entertainment options in this city, but it’s proven to me again and again that Chaplin (or Keaton) will still pack them in at Cinefamily, as they run these films every year or so to new and delighted audiences. Last time they ran Modern Times, though, I think I wasn’t able to go. This time it coincided with my volunteering night, so once I finished taking tickets, seating people, and clearing up a minor popcorn vs gravity issue, I settled in just as the credits finished to watch my favorite Chaplin film with a wonderfully receptive audience. I’ve seen Modern Times probably five or six times, but never before with an audience, and it added an awful lot to the experience. 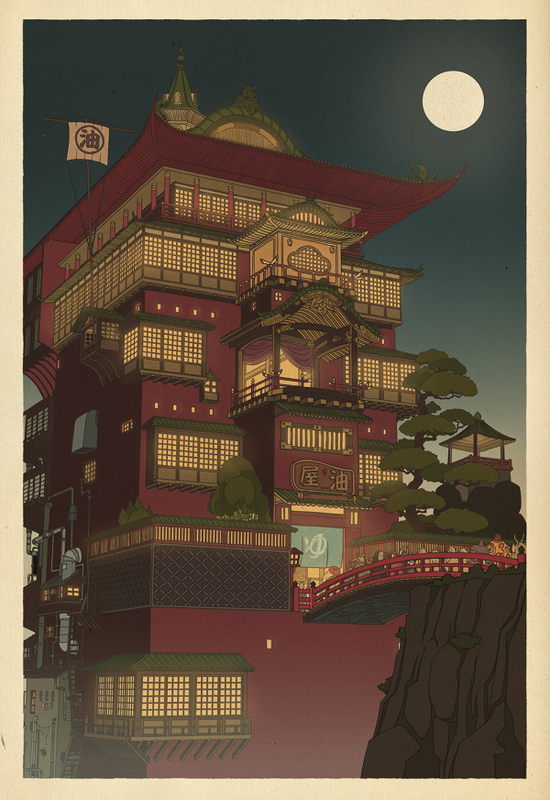 The film itself is incredible, and falls squarely within my top twenty of all time. 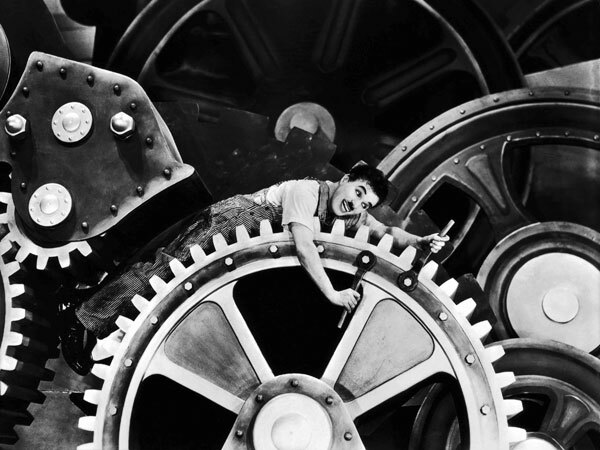 Chaplin’s tramp starts off as a cog in the machine (literally, at one point) of a steel factory, spending his days tightening bolts on an endless stream of conveyor-belt carried steel plates. Slowing down piles him into the workers further down the assembly line, and stopping (for lunch) puts him into spasms as his muscles try to continue the tightening motions. After being put into an automatic lunch machine to test it – with hilarious results – he ends up having a nervous breakdown, losing his job, getting arrested by accident, meeting up with an orphan waif from the docks, trying to find a job to support her and protect her from the child services authorities, etc. Every time I watch this film, I’m amazed again at just how much goes on in it – I forget that the roller-skating scene in the department store is here, for example, or the Tramp stopping the jailbreak. Part of that is because to some degree, a lot of the gags could be interchanged with any gags in his shorts; part of it is that there are so many moments indelibly associated with Modern Times and etched forever in my brain that it’s understandable that I would miss a few. But for a good chunk of the audience, this was their first experience with any of it. 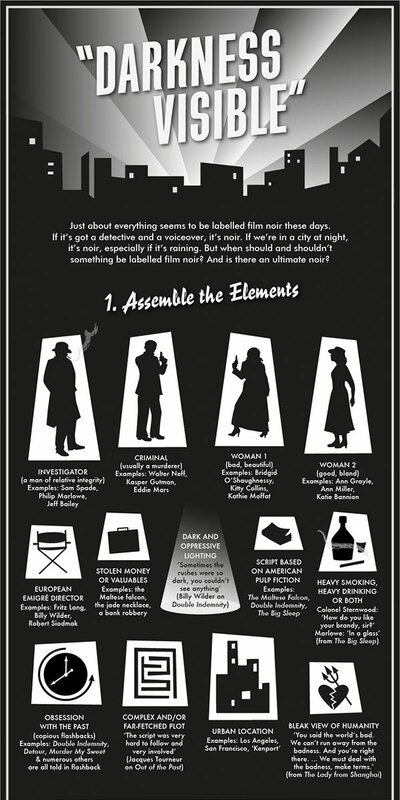 There’s no doubt some of the people had seen it before – you don’t get 150 people at Cinefamily to watch a silent film and them all be first-time viewers. But others were going with their guts, laughing as they realized the gag that was being set up (like the woman walking down the street with bolt-like buttons on the bust of her dress), crying out “no way!” when the Tramp maneuvered his way through hundreds of would-be factory works to get the last job, gasping when Chaplin pulled off a particularly flashy stunt, like rollerskating blindfolded three inches from a precipitous drop. All these story elements still work, and some of them work even better now, because we know that if someone did the roller-skating scene today, they’d be in no danger. The drop would be green-screened in, or Chaplin would be on wires that would later be digitally removed, or there would be a trained stuntman taking his place. But we know instinctively watching this scene that Chaplin really did this stunt, that he really was skating that close to the edge, and that he really could’ve fallen. There’s a wonder to that knowledge that lasts throughout the ages. 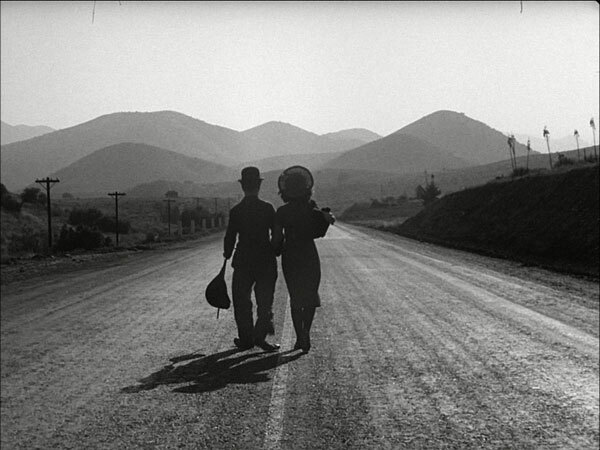 But Modern Times is far more than treacherous stunts – in fact, it depends on them far less than some of Chaplin’s earlier films, or Keaton’s films, or the virtuoso third act of Lloyd’s Safety Last. All the other gags continue to work as well, even the ones that have lost some amount of context over the years. We may not know about the labor disputes of the 1930s or the communist rallies, but it’s pretty clear what’s going on in all those parts, and Chaplin’s unwitting involvement in them is imminently understandable. Even the kids scattered throughout the audience were totally on board – one near me was jabbering nonstop about the nonsense song as his family left the theatre after the show. He was fascinated and trying to figure out what language it was in. You’ll see the sun come shining thru for you. These days, Chaplin is often scoffed at for his sentimentality, and it’s easy to see why modern audiences often gravitate towards the stoic Buster Keaton instead. Even I do most of the time. But here, Chaplin’s pathos is so perfectly pitched, and balanced so well with the humor and with the Metropolis-lite satire on a mechanistic society, that it works splendidly. 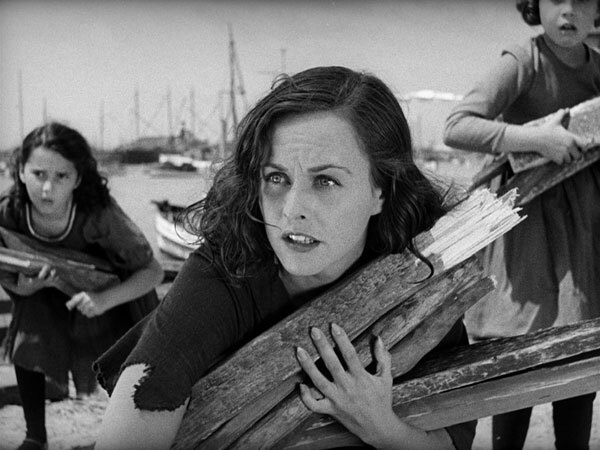 I can’t watch Chaplin and Paulette Goddard walk off into the sunset without getting a well-earned tear in my eye. Speaking of Goddard just briefly, with all the praise of the actors in The Artist for imitating silent acting styles so well (and I think they do), it’s even more refreshing to watch Goddard, who started in movies right at the turn from silent to sound, simply inhabit her anachronistic character, darting furtive glances around with her whole being, acting with every part of her body to get that dynamic movement that sound films lost almost immediately. Everyone in the theatre had smiles radiating from their faces as they walked out of the theatre, everyone from the people who come to Cinefamily’s silent film presentations every week to the families with children who might’ve been seeing their first silent film, to college-age students and jaded film bloggers like me. I almost didn’t stay to watch the film. After all, I thought, I’ve seen this half a dozen times. Mightn’t my time waiting until it’s time to take tickets for the next screening be better spent studying up on golden era exhibition for a post I’m planning, or working on my Blind Spot review of The Virgin Spring, or catching up on everyone’s blogs? But no. I made the right decision, because sharing a movie you love with a large group of appreciative viewers in a big-screen setting is always the right thing to do.